Energy inefficient. Lenovo offers a simple office notebook with a Pentium dual-core processor for 339 Euro (~$425). The operating system must be chosen for there is none. Our test will show whether Lenovo delivers a cheap office notebook or a weak low-priced notebook with the IdeaPad G580-MBBG3GE. Lenovo offers a range of notebooks in different performance classes with the IdeaPad G580 being one of the budget editions. The Chinese manufacturer titles the G580 machines as multimedia notebooks. This is not true for the IdeaPad G580-MBBG3GE version tested by us because this is a mere office machine. Other versions equipped with Intel Core processors and Nvidia GeForce GT 630M-GPUs do a better job at proving their multimedia capabilities and proving the name to be right. Our test model is equipped with an Intel Pentium B960 processor (dual-core CPU). An Intel HD Graphics (Sandy Bridge) GPU is responsible for the graphics processing. The system may use up to 4 GB of memory. Data is saved onto a 320 GB hard drive. 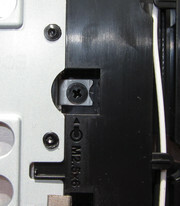 A DVD burner is included as well. Possible competitors are the Sony Vaio VPC-EH3C0E/W (Intel Pentium B960, Intel HD Graphics from Sandy Bridge) and the Lenovo G585 (AMD E2-1800, AMD Radeon HD 7340). We have recently tested the very similar Lenovo IdeaPad Z580 which is also oriented towards multimedia. Note: The review sample provided to us came with a keyboard layout which did not support German. Furthermore, wrong labels were stuck on the machine which said that the laptop featured a Core i5 and the Nvidia GeForce GT 650M. This is to avoid any confusion regarding the images of the laptop in this article. The lid shows fingerprints quite easily. There is a large service hatch at the bottom. 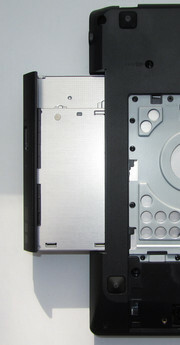 Regarding the shape of the casing and positioning of the connectors, the Lenovo G585 and the IdeaPad G580 are identical. The colors and applied materials are different however. 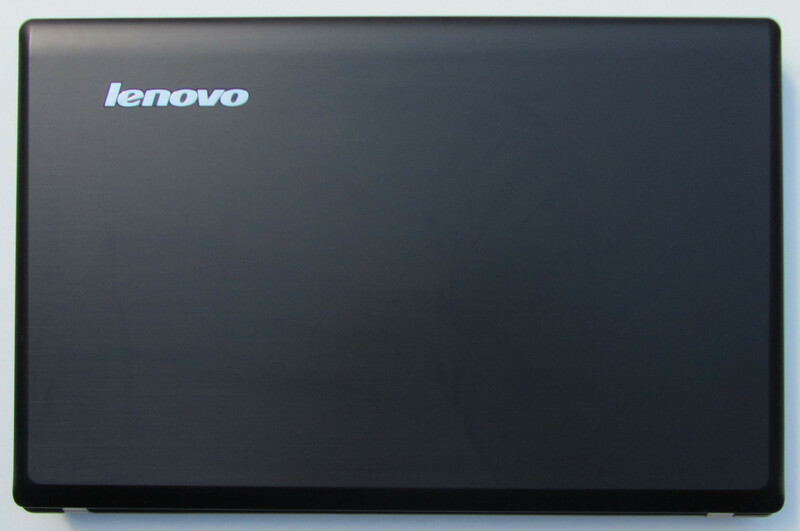 The Lenovo G585 predominantly consists of shiny black plastics. Only the bottom is made of matte plastics. The IdeaPad G580 mostly consists of matte plastics. Reflections are thus avoided and it just looks better. The case is painted dark brown but you have to take a very close look to see if it is brown. The back of the cover is made of matte plastics with metallic accents. It looks like brushed metal. The top of the base unit consists of real brushed metal and gives the notebook a high quality appearance. We cannot understand why Lenovo does not mention this at all in the product description. Unfortunately, the lid and top of the base unit show fingerprints easily. The keyboard enclosure is also made of matte plastic material that is a good choice on this laptop. But even the IdeaPad G580 is not completely free of glossy surfaces. The display bezel and the display are extremely reflective. The case makes a good impression. It does not warp under pressure. The frame above the optical drive is quite sturdy. If the opened notebook is lifted using its corners, it twists slightly. The hinges hold the screen static. The lid wobbles when it is suddenly released. All in all, one can say the buyer gets a solid and visually appealing case. This is not always the case at a price of 339 Euro (~$425). The connections and their positioning are identical to the Lenovo G585. There are two USB 3.0 ports on the left-hand side of the notebook. Those, who want to use it as DVD player for their flat-screen TV at home will be delighted with the HDMI connection. On the left, we also find a VGA output, one Ethernet port and a slot for a Kensington Lock. There is a third USB connection on the right-hand side. This one only supports the USB 2.0 standard. In addition, there is a combo connection for the headphone and microphone. The memory card reader is located at the front. This notebook supports the use of SD and MMC cards. In terms of communication options provided, the Ideapad G580-MBBG3GE and the Lenovo G585-M8325GE are identical. The WLAN module AR9285 is provided by Atheros. The module supports the 802.11 b/g/n standards. The computer connects with wired networks via the Ethernet port. Unfortunately, Lenovo only uses a Fast-Ethernet chip for the Ideapad G580-MBBG3GE too. This one is by Atheros as well. A Gigabit-Ethernet chip should be standard nowadays - even with notebooks from the lowest price-range. The buyer also gets a Bluetooth Module (AR3011). It is by Atheros and supports the Bluetooth standard 3.0. Besides battery and power supply, we find brief instructions and warranty information in the box. There are no other accessories. The IdeaPad G580-MBBG3GE comes with FreeDos. We tested the latest operating systems available by installing it ourselves. Windows 8 (Release Preview, 64bit version) works absolutely fine. Most hardware components (like the WLAN, LAN, Webcam and Bluetooth) were ready to be used directly after installation. The operating system did not come with a driver for the memory card reader. Windows 7 drivers on the Lenovo website helped us a lot with this. After the Windows update, we found another two components in the device manager without any drivers. This should change with the release of Windows 8. Windows 7 can, of course, be used on the Lenovo IdeaPad G580 without any problems. The notebook has been designed for this operating system and the Lenovo website offers all necessary drivers. 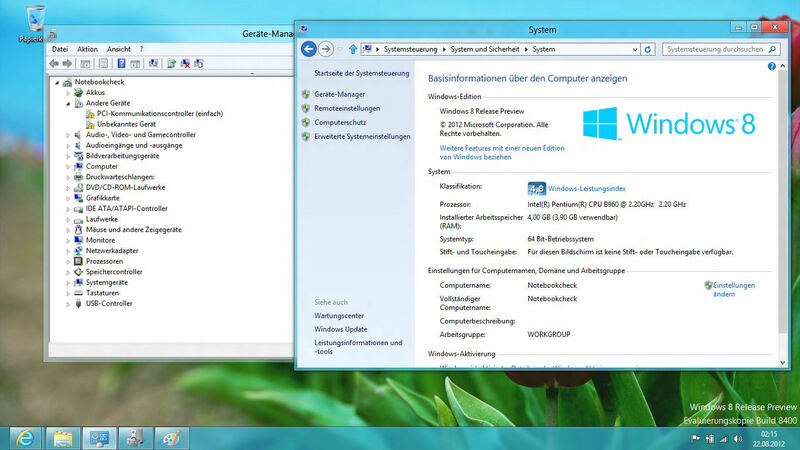 Windows 7 Home Premium can currently be purchased for 60 to 80 Euros (~$75 - $100). We installed Windows Vista to check the laptop performance. After installing the two service packs, the system worked without any difficulties, Windows Vista, however, hardly offers any drivers for the hardware built-in. We ran Windows update to download the newest updates and drivers. After installing the updates, Windows Vista was booted but the screen remained black. The starting melody told us Windows Vista was starting. We did not see any progress past the initial screen. 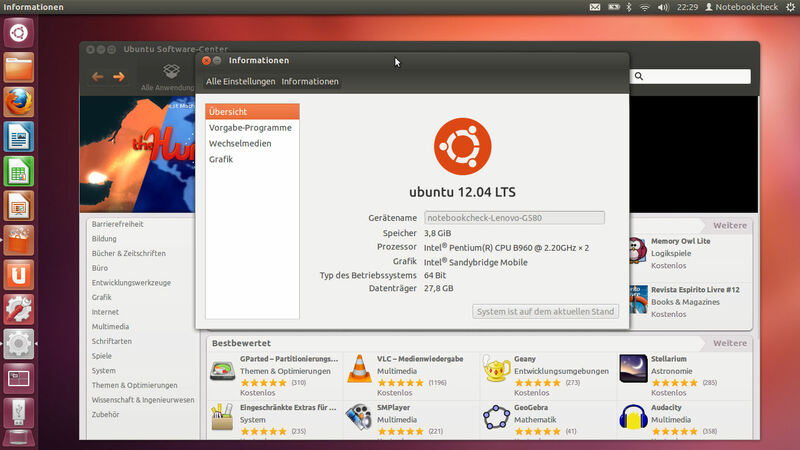 For an inexpensive operating system, we recommend users to have a look at Ubuntu Linux 12.04 (64bit-Version). It can be downloaded for free. Ubuntu Linux works fine on the IdeaPad G580-MBBG3GE. All components (WLAN module, webcam, memory card reader, Bluetooth) were recognized during installation and were set up automatically. 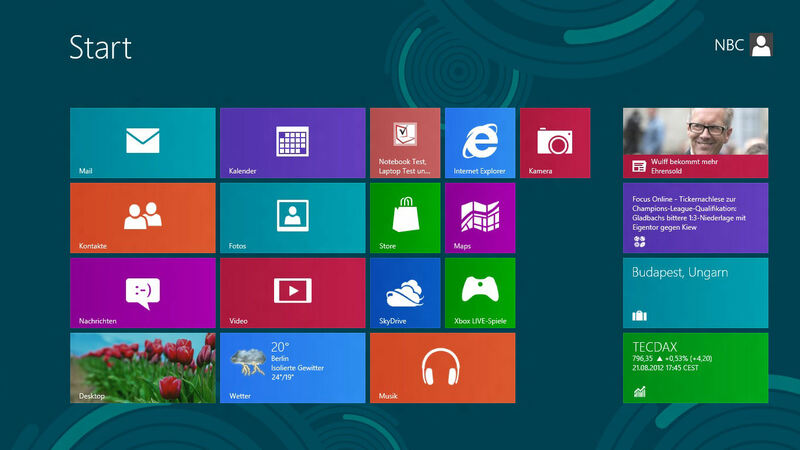 We tested the release preview of Windows 8. Almost all components were recognised. Ubuntu Linux 12.04 works fine. Like the Lenovo G585, maintenance of the IdeaPad G580 is very easy. There is a big service hatch at the bottom of the notebook providing access to most of the components. The notebook has two memory banks, one of which is occupied. Therefore, it would be easy to upgrade to 8 GB with little money. This would be the maximum as the notebook supports a maximum of 8 GB memory. The CPU could support up to 16 GB. 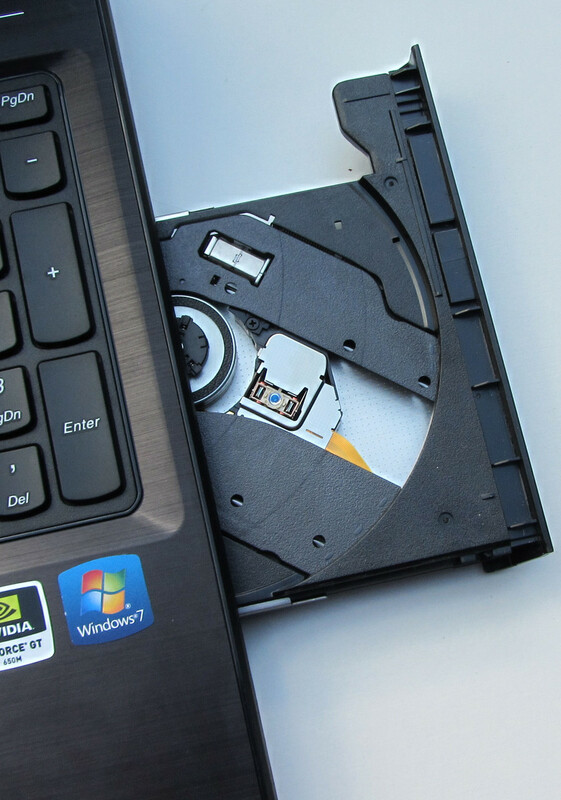 The built-in hard drive could be replaced by another one with little effort. Just loosen the two screws, take the hard drive, screw the hard drive cage onto the new hard drive, and insert the hard drive back into the notebook. That's all there is to it. There is access to the WLAN module as well. Access to the fan is limited however. Lenovo provides a 12-month carry-in warranty. In case of damage, the customer will need to send the notebook directly to Lenovo. Like with the Lenovo G585, the documents of the notebook have a surprise for you: a warranty extension. Lenovo extends the warranty on our test model to 24 months. Kudos to Lenovo for this point. Even significantly more expensive notebooks are often delivered with a one-year warranty like the Sony Vaio VPC-EH3C0E/W. 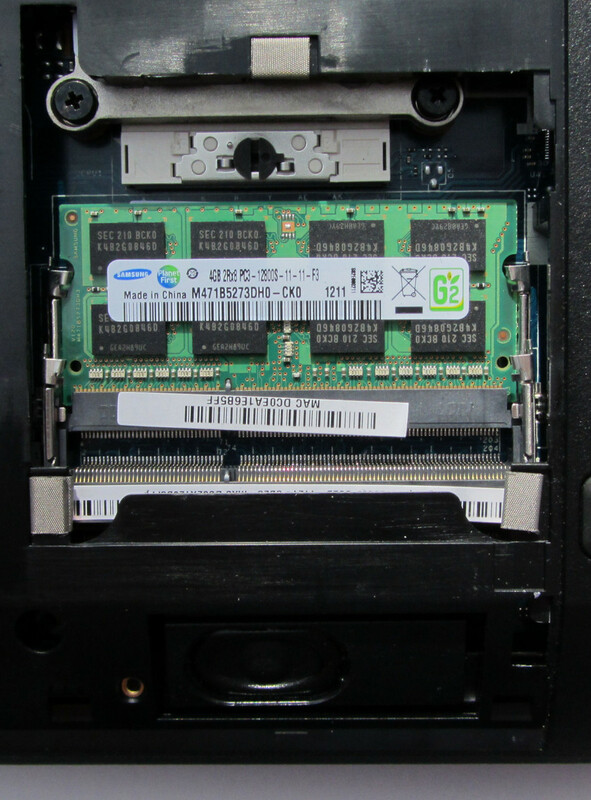 We cannot tell whether this warranty extension is added to every Lenovo IdeaPad G580. It may be possible that the extension is reserved to certain dealers only. The warranty extension does not include the battery which is covered by the usual one-year warranty. In case there is no warranty extension added or the warranty period is to be further extended, Lenovo offers certain package deals. They offer an extension of the warranty period to 24 or 36 months for a price of about 30 and 80 Euro (~$40 and $110) respectively. 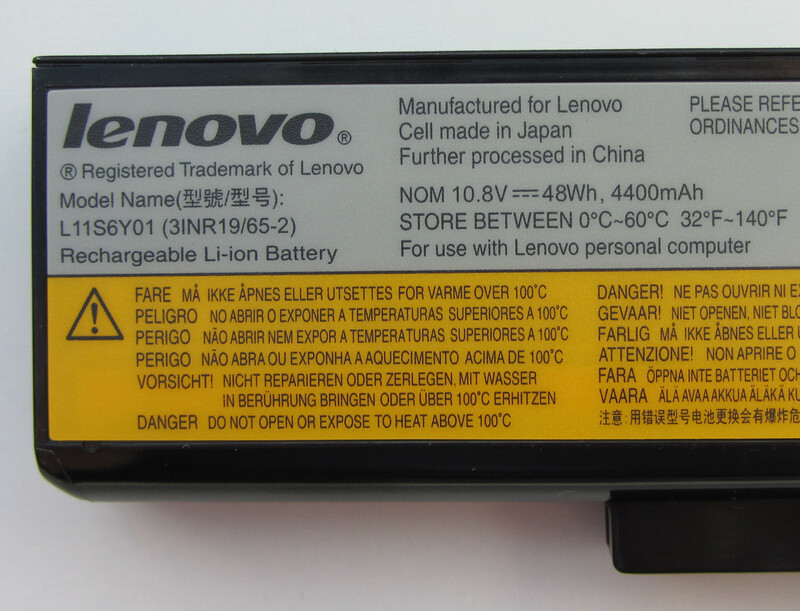 In the Lenovo-Online-Shop, the available warranty extension can be enquired when entering the serial number. These do not need to be bought in the Lenovo online shop but can be purchased at an independent dealer. We have seen the keyboard of the notebook before. The strong similarity to the Lenovo G585 cannot be denied at this point. The IdeaPad G580-MBBG3GE has a Chiclet keyboard (called the "AccuType" keyboard) and includes a numeric pad too. The keys make typing very comfortable. The keys have sufficient travel and provided a good stroke. As with the Lenovo G585, the "enter", "backspace" and right "shift" key are a bit smaller than usual, so it is easy to miss them. It takes a bit to get used to it. All in all, one can say the keyboard is good enough for people writing a lot. The Ideapad G580 touchpad is very different from the Lenovo G585. In terms of appearances, Lenovo managed to design a masterpiece. The touchpad has a thin, silver metal frame surrounding it, which gives it a nice touch. The size of the touchpad is 5 cm x 10 cm. The surface is slightly dimpled and the dimples are smaller than those of the Lenovo G585. The fingers can easily slide over the surface. The scrolling area is highlighted with colors which is something nice to have. 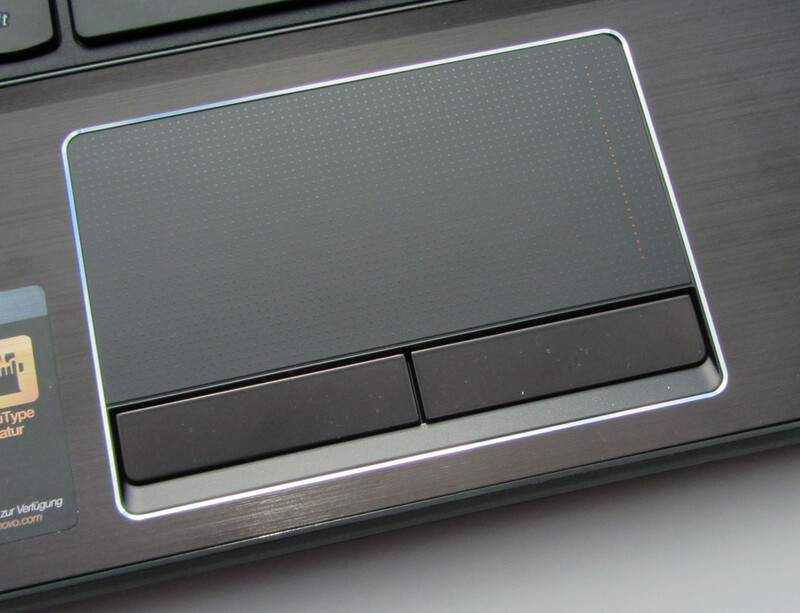 The mouse buttons are below the touchpad. Both have a clear pressure point. The touchpad comes from Synaptics and offers multi-touch gestures. Therefore, functions such as zooming-in with two fingers are possible. The notebook is equipped with the typical AccuType keyboard. The thin metal frame gives it a very attractive look. Lenovo equips the notebook with a 15.6-inch display with a 1366x768 pixel resolution. The screen has a glossy surface. LEDs illuminate the display. Other displays are not available for the IdeaPad G580. 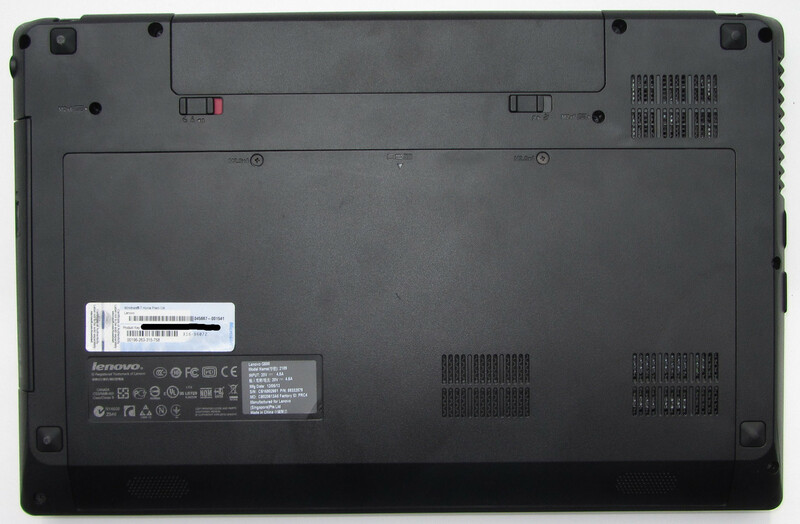 Both the Lenovo G585 and IdeaPad G580 display have the same make, the LP156WH4-TLN1. Nevertheless the test results are different. The average display brightness of the IdeaPad G580 is rather modest at 196.6 cd/m². The Lenovo G585 offers much more with an average of 236 cd/m². 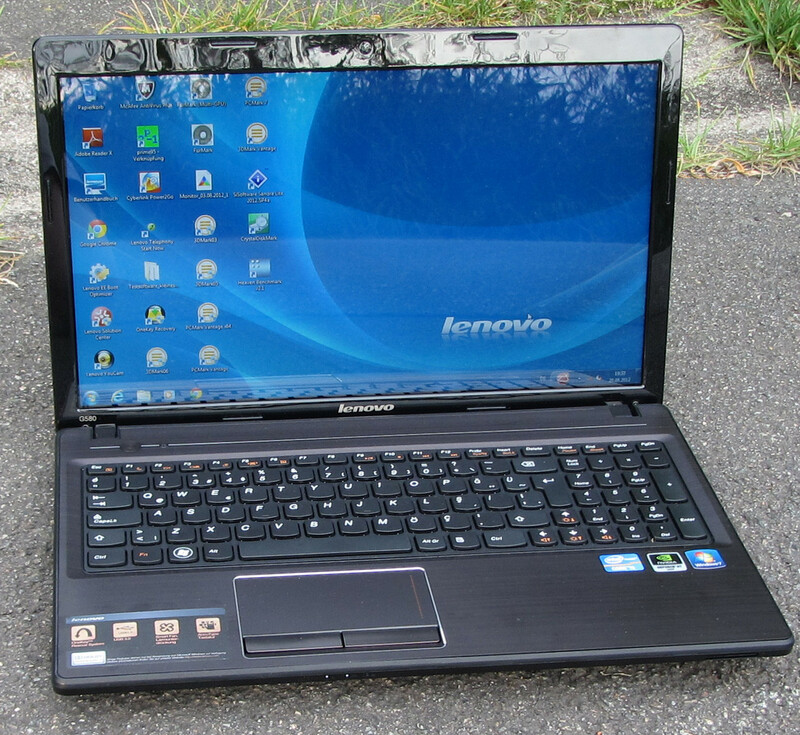 The illumination of the Lenovo G585 (86 percent) is a bit better than the IdeaPad G580 (82 percent). The test results of the Sony Vaio VPC-EH3C0E/W are more or less on a level with the IdeaPad G580-MBBG3GE. Things are different regarding contrast and black levels. Here, with a black level of 1.19 cd/m² and contrast of 161:1, the IdeaPad G580 performs a bit better than the Lenovo G585 (1.61 cd/m² and 145:1) and the Sony Vaio VPC-EH3C0E/W (1.54 cd/m² and 144:1). 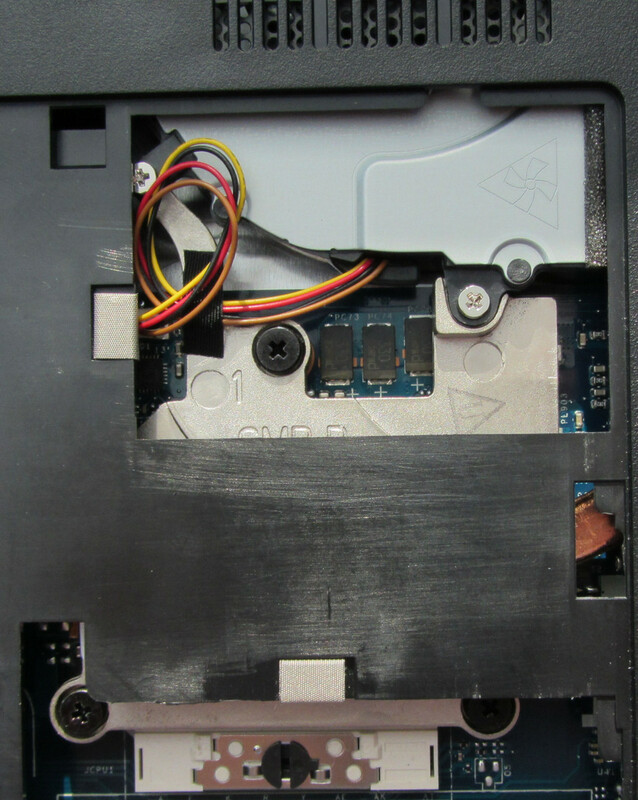 In absolute terms however, the results of the IdeaPad G580 are bad. It should be mentioned that the subjective impression of the display is much better in daily office use than the test results may suggest. 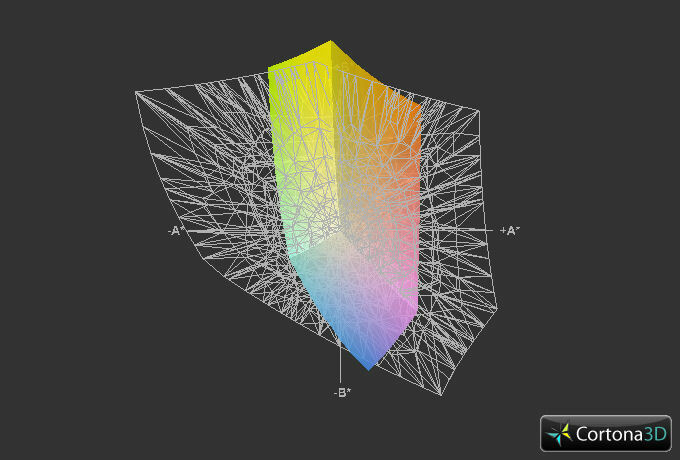 The display can neither show the sRGB nor the AdobeRGB color space. This should not be a problem as these color spaces are only required in professional image editing and graphics design. The IdeaPad G580-MBBG3GE used outdoors. 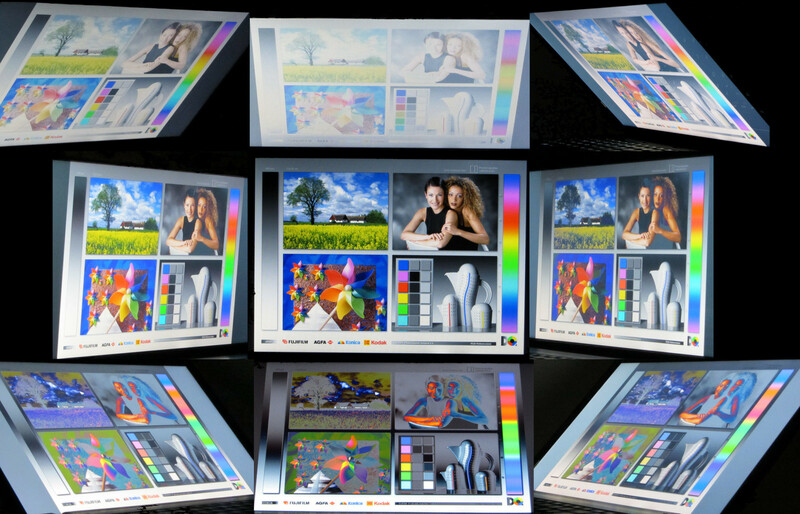 The low brightness and reflective surface of the display make outdoor usage rather difficult. Very bright environments and direct sunlight are to be avoided. In terms of viewing angle stability, one gets exactly what one would expect from a computer in this price range. A small change in the vertical viewing angle results in the inversion of the image. Things are different with the horizontal viewing angles. Here, the image remains stable for larger angles. The IdeaPad G580-MBBG3GE is mainly an office device. It is supposed to manage daily tasks like chatting, surfing the Internet, playing YouTube videos, DVDs and word processing. It is also good as a video player in the living room because it works quietly and has a HDMI port. Lenovo offers other far more powerful models in the IdeaPad G580 series. Our tested model is also available with a Core i3 processor, a larger hard drive and Windows 7 which would cost around 500 Euro (~$625). Models with Core i5 and Core i7 processors and Nvidia GeForce GT 630M GPU are available as well. These versions would be interesting to gamers too. Prices are between 600 and 700 Euro (~$750 to $875). Our review sample uses an Intel Pentium B960 processor. The CPU has two cores and comes from the Sandy Bridge processor generation. The processor operates at a speed of 2.2 GHz. The CPU has no Turbo Boost. Maximum performance was always available during our stress test and we did not notice any throttling. In the battery mode, the CPU operated at 2.2 GHz as well. The same was observed for the GPU. The CPU passed the Cinebench tests with the CPU at full load as well. The test results are as expected. The Sony Vaio VPC-EH3C0E/W is always a bit ahead of the IdeaPad G580 in the CPU test. The Sony notebook, however, clearly wins the GL tests of Cinebench 10. The IdeaPad G580-MBBG3GE is the clear winner of Cinebench 11 GL test. We cannot explain the strikingly different results in the GL tests as the GPU of the Ideapad G580 was running at maximum performance (1100 MHz) during the GL tests. The Lenovo G585 was beaten in the CPU tests which was an expected result. In the GL tests, however, it was able to compete with the IdeaPad G580-MBBG3GE. One look at the list of components already reveals that the notebook is not the fastest. Nonetheless, the system works smoothly and does not get stuck. In the PC Mark tests, the computer achieves similar results to those obtained from other notebooks with this entry-level CPU. The Acer TravelMate 5744Z-P624G50Mikk (Intel Pentium P6200, Intel GMA HD Graphics) or Lenovo ThinkPad Edge E525-NZ62KGE (AMD A8-3500M, AMD Radeon HD 6620G) all perform similarly. The notebook is slightly ahead of the Sony Vaio VPC-EH3C0E/W and clearly beats the Lenovo G585. Lenovo equips the IdeaPad G580-MBBG3GE with a Toshiba hard drive (MK3265GSX). The hard drive has a capacity of 320 GB and operates at a speed of 5400 rpm. The average access rate is about 68.5 MB/s. The access time was about 17.2 ms. We could get more performance out of the machine. For doing so, the hard drive should be replaced by a model that operates at 7200 rpm. A Solid State Disk could be used as an alternative. The Intel Pentium B960 also provides the graphics chip for the notebook: the Intel HD Graphics (Sandy Bridge) chip. Intel hasn't given the DirectX 10.1 GPU any separate label. It is based upon the Intel HD Graphics 2000 chip and represents the weakest performing GPU Intel currently offers. Functions such as Intel Quick Sync (supporting playing of HD videos) are left out. HD videos can be played on this machine. The processor takes over most of the work. We tested it with a video in Full HD resolution (1920x1080 pixels) and H.264 encoding. The CPU usage peaked at about 80 percent. The video was played smoothly with no skipped frames. The results in the different 3D Mark tests are on the level expected because the GPU works at peak peformance even under full load. 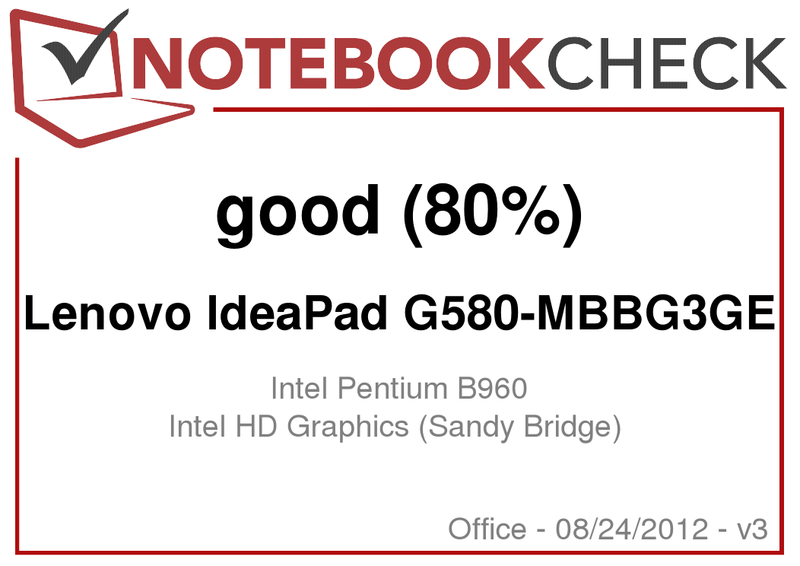 The Lenovo IdeaPad G580-MBBG3GE is always slightly ahead of the Sony Vaio VPC-EH3C0E/W (Intel HD Graphics from Sandy Bridge) and a bit behind the Lenovo G585 (AMD Radeon HD 7340). The Lenovo G585 gets the best results in the 3D Mark 11 benchmark because the Intel-GPU does not support DirectX 11 functions and thus could not perform this benchmark. The Lenovo IdeaPad G580-MBBG3GE is not a notebook for gamers. The frame rates in the games tested are too low to be considered. The maximum would be trying out a game at low resolution and low quality. For passionate gamers, Lenovo offers versions of the IdeaPad G580 which come with the Nvidia Geforce GT 630M GPU. 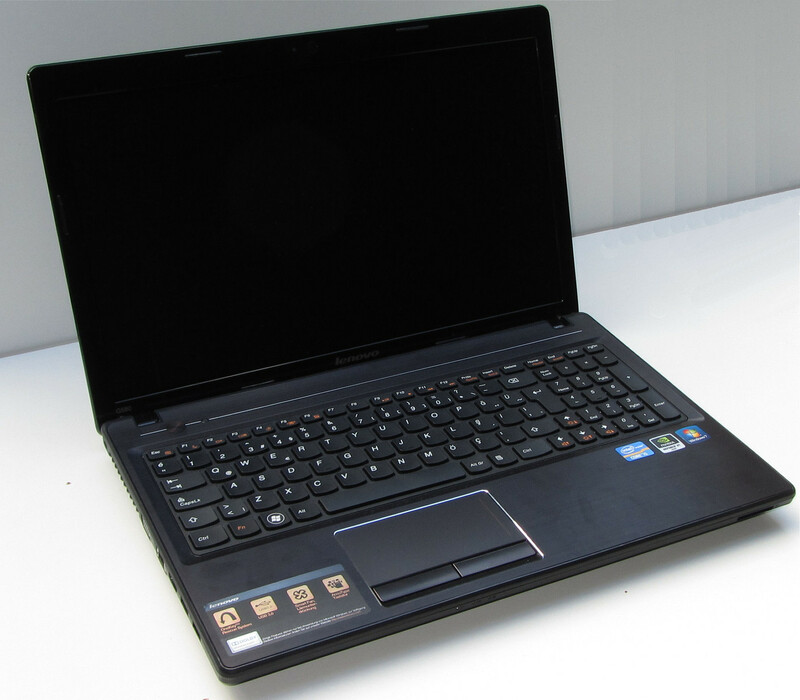 Like the Lenovo G585, the IdeaPad G580-MBBG3GE remained quiet all the time while idle. We measured 30 to 32.6 dB. The fan was running all the time but it could only be heard in a quiet environment. Even under full load (Prime95 and Furmark working simultaneously) the noise was still acceptable at 37.7 dB. The Sony Vaio VPC-EH3C0E/W showed the same good test results. The Lenovo IdeaPad G580-MBBG3GE during our stress test. Temperatures were fine while in idle mode. At the top as well as at the bottom, the notebook reached temperatures between 27 and 34 °C. These temperatures ensure that working with the notebook is pleasant and allow its placement on one's lap. 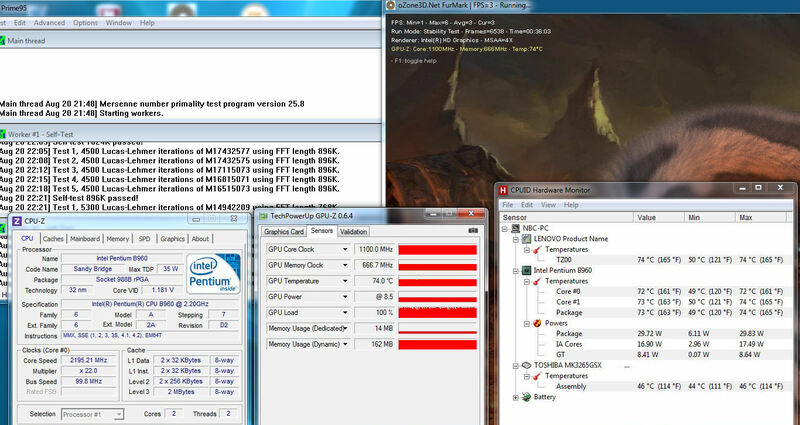 Under full load (Prime 95 and Furmark operating simultaneously), the temperatures reached between 31 and 47.1°C. The high temperature of 47.1°C was measured on the left side of the palm rest. Such a temperature makes working with the notebook unpleasant. The temperatures of the Lenovo G585 are clearly below those of the IdeaPad G580-MBBG3GE. This does not surprise because the AMD-APU (AMD E2-1800) built into the Lenovo G585 consumes way less energy than the Intel Pentium B960. Sony, however, deals better with the heat generation. The temperatures of the Sony Vaio VPC-EH3C0E/W are clearly below those of the IdeaPad G580-MBBG3GE. Both CPU and GPU were operating at full speed at all times during our stress test (Prime 95 and Furmark operating simultaneously for at least one hour). There was no throttling. The CPU temperatures kept hovering around the 73-74°C mark. (-) The average temperature for the upper side under maximal load is 39 °C / 102 F, compared to the average of 29.4 °C / 85 F for the devices in the class Office. (-) The maximum temperature on the upper side is 47.1 °C / 117 F, compared to the average of 33.9 °C / 93 F, ranging from 21.2 to 62.5 °C for the class Office. (-) The palmrests and touchpad can get very hot to the touch with a maximum of 47.1 °C / 116.8 F.
(-) The average temperature of the palmrest area of similar devices was 28.2 °C / 82.8 F (-18.9 °C / -34 F). 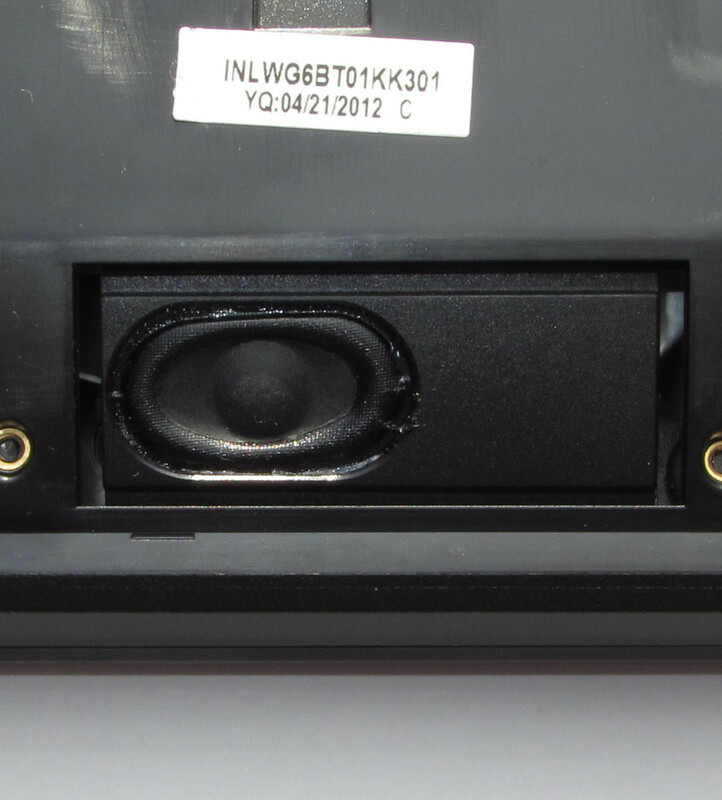 The IdeaPad G580-MBBG3GE, as well as the Lenovo G585, has its speakers at the bottom. The speakers provide pleasant sound. One can understand speech quite well. We have heard way worse speakers from review units. The speakers are more than sufficient for an office device and if you don't like the sound, you can always connect it to external speakers or use headphones whenever you want to. In terms of energy intake, the Lenovo IdeaPad G580-MBBG3GE does not convince. While being idle, we only measured energy consumption from 11.8 to 16.2 W. The Sony Vaio VPC-EH3C0E/W is considerably below this with measurements of 8.6 to 12 W. Under full load (Prime 95 and Furmark operating simultaneously), the energy consumption was identical with that of the Sony (49.3 W) measuring 51.1 W. The same was observed for conditions during the running of a benchmark (3D Mark 06). In this case, the Sony measured 37.5 W while the G580 recorded 37.1 W. The energy consumption of the Lenovo G585 is clearly below the one of the IdeaPad G580-MBBG3GE and the Sony Vaio VPC-EH3C0E/W in every load range. This does not surprise us as the AMD APU consumes considerably less energy than the Intel Pentium B960. It should be mentioned, however, that the CPU part of the AMD APU performance is considerably lower than the CPU part of the Intel Pentium B960. When idle, the IdeaPad G580-MBBG3GE has a runtime of 5 hours 18 minutes (Sony: 6 hours 12 minutes, G585: 8 hours 40 minutes). We tested the idle mode runtime with the Battery Eater Reader Test. This means that the display is working at minimum brightness, the energy-saver mode is activated and all wireless modules (WLAN, Bluetooth) are deactivated. When completing demanding tasks, the IdeaPad G580-MBBG3GE records a runtime of about 1 hour 9 minutes (Sony: 1 hour 26 minutes, G585: 2 hours 2 minutes). Under load, the notebook completed the Battery Eater Classic Test with the screen at full brightness, the high-performance profile activated and the wireless modules switched on. The WLAN-Test ran for about 3 hours 36 minutes (Sony: 4 hours 5 minutes, G585: 5 hours). During this test, websites are automatically opened every 40 seconds via a script. The energy-saver profile is activated and the display brightness is set to about 150 cd/m². The Lenovo IdeaPad G580-MBBG3GE has a runtime of 3 hours 19 minutes (Sony 3 hours 11 minutes, G585: 4 hours 1 minute) in the DVD test. That's enough to watch two feature length movies. For the DVD test, the wireless modules are deactivated and the display is at maximum brightness. In case the DVD does not play smoothly, the energy-saver profile is deactivated and a higher performance profile is used. All in all, the IdeaPad does not offer particularly good battery runtimes. Lenovo seems to be aware of this and promises a 5 hour runtime for the notebook. They kept their promise. Sony manages to get more runtime out of the same platform with the same battery capacities. The measurements of consumption are reflected in the test results. In idle mode, the IdeaPad G580-MBBG3GE needs much more energy than the Sony Vaio VPC-EH3C0E/W. The Sony notebook runs longer in idle mode accordingly. Both notebooks cannot reach the runtimes of the Lenovo G585. Lenovo offers an entry-level computer for a low price with the IdeaPad G580-MBBG3GE. Those who are looking for a laptop for typing and that handles all types of Internet communication and can play most video formats will be on the safe side with the IdeaPad G580-MBBG3GE. An alert consumer will have noticed that this conclusion is very similar to the one about the Lenovo G585. If a consumer is interested in the IdeaPad G580-MBBG3GE, one should consider the Lenovo G585 as well and base his/her decision on the differences between the two. For long battery life and low energy consumption, choose the Lenovo G585. For more CPU performance and a matte case which gives it a good appearance, buy the IdeaPad G580-MBBG3GE. The DVD burner reads and writes all types of DVD and CD. The speakers are at the bottom of the notebook. ... the DVD drive can be taken out. There is only limited access to the fan. It is very easy to take out the hard drive. 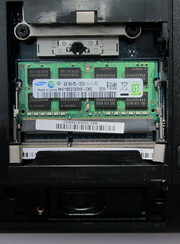 The computer has two memory banks. 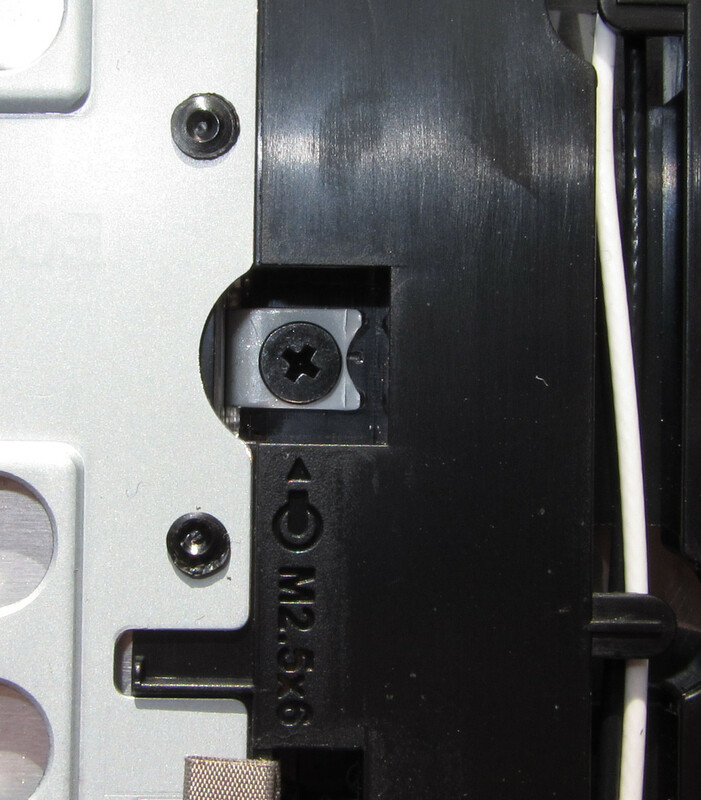 The service hatch is held by only two screws. ...it has a capacity of 48 Wh. The notebook has two USB 3.0 ports and good input devices. In addition, the notebook works very quietly most of the time. We also like the 24-month warranty. Better battery life. The Sony notebook proves that better runtimes are possible. Lenovo uses metallic accents on such a cheap notebook. The competitors are the Sony Vaio VPC-EH3C0E/W and the Lenovo G585.